Posted April 9, 2019 & filed under Fire Alarm Systems. Installing a commercial fire alarm system inside your business is important when it comes to fire safety. Nevertheless, it’s equally as important for you to maintain your commercial fire alarm system over time to make sure it’s working the way it should. Here are some of the things you’ll need to check for when you’re maintaining your commercial fire alarm system. Are the batteries in your commercial fire alarm system drained? You can have the best commercial fire alarm system in the world set up. However, if the batteries in it are drained down to almost nothing, it won’t matter. 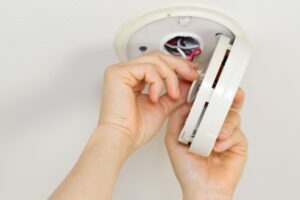 You should consider replacing batteries in a fire alarm system when they dip down into the 50 to 70 percent capacity range. You should also replace any battery that has fallen below the 50 percent mark or been in place for more than 3 to 5 years. Clearly label batteries so that you know how long they’ve been around. Is there dirt, dust, and other debris built up in and around smoke detectors? If the smoke detectors in your commercial fire alarm system have dirt, dust, and debris built up in and around them, it could increase the number of false alarms that you experience. Make sure you get into the habit of cleaning dirty smoke detectors and replacing those that are beyond cleaning. This will ensure your smoke detectors are fully functional at all times. Do your heat detectors need to be cleaned? You’ll need to worry about cleaning more than just your smoke detectors. There are also heat detectors in a commercial fire alarm system that need to be cleaned and maintained over the years. You also need to be sure not to paint over them if you ever have your business painted. Dirt and paint can prevent heat detectors from doing their job. Is it time to replace any of the parts in your commercial fire alarm system? Life Safety Consultants can set you up with the fire alarm parts you need to keep your system up and running. Call us at 888-557-0558 today to order parts for your system.